How and Where to Buy Linzess Online? CanadianPharmacyWorld.com offers the brand Linzess at unbeatable prices. A valid prescription from your doctor is required. Canadian Pharmacy World carries brand and generic medications from International pharmacies around the world with a valid prescription from your doctor. You can place an order online at www.CanadianPharmacy World.com or call Customer Service at 1866-485-7979. If you have any questions, please refer to FAQ. Are there Alternative Names for the Brand and Generic Linzess? 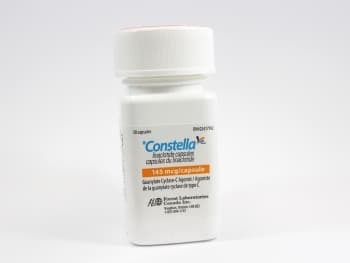 The brand Linzess capsules come from Canada also called Constella manufactured by Forest Laboratories and from UK also called Constella manufactured by Almirall. There is no generic available for this medication. What Dosages and Forms is LInzess available in? What is Linzess used for? Linzess (Linaclotide) is a prescription medication that is used to treat chronic constipation or irritable bowel syndrome (IBS) in adults. Linaclotide belongs to the class of medications called guanylate cyclase-C agonists. It works by improving stool texture and it lessens the symptoms such as bloating, abdominal pain or discomfort, straining and feeling of incomplete bowel movements. It also blocks pain signals in the intestines. Linzess should not be given to children under the age of 18. The ususal dose for adults with irritable bowel syndrome is 290 mcg once daily and for chronic constipation is 145 mcg once daily. What are the Possible Side Effects of Linzess? Are there any Precautions or Drug Interactions for Linzess? You should not take Linzess if you are allergic to Linaclotide or if you have any other allergies. Before you start taking this medication, talk to your doctor about your medical history and about all the medications you take including OTC and herbal medications. Linzess should not be used during pregnancy unless it is clearly needed. It is unknown if this medication passes into breast milk. Linzess capsules should be stored in its original container at room temperature away from light and moisture and out of reach of children and pets. Do not store this medication in the bathroom.